Waterfalls commonly form where water rushes down steep hillsides in upland areas. They are typical of the upper valley but can be found in the rivers lower courses where the process of rejuvenation creates enough potential energy for vertical erosion to recommence closer to the mouth of the river. The height and number of waterfalls along a stream or river depend upon the type of rocks that are being eroded by the water. This typically occurs in areas where alternating bands of bedrock, made up of varying levels of resistance, form the bedrock. Some types of rocks (shale, for example) wear away more easily than others (such as sandstone or limestone). As the river or stream wears away the weak rocks, they travel across the surface of stronger rocks. These more resistant rocks become the capstones to waterfalls. The number and thickness of these stronger rock units in a vertical sequence of rocks control how many waterfalls there are and how much vertical drop there is on each waterfall. 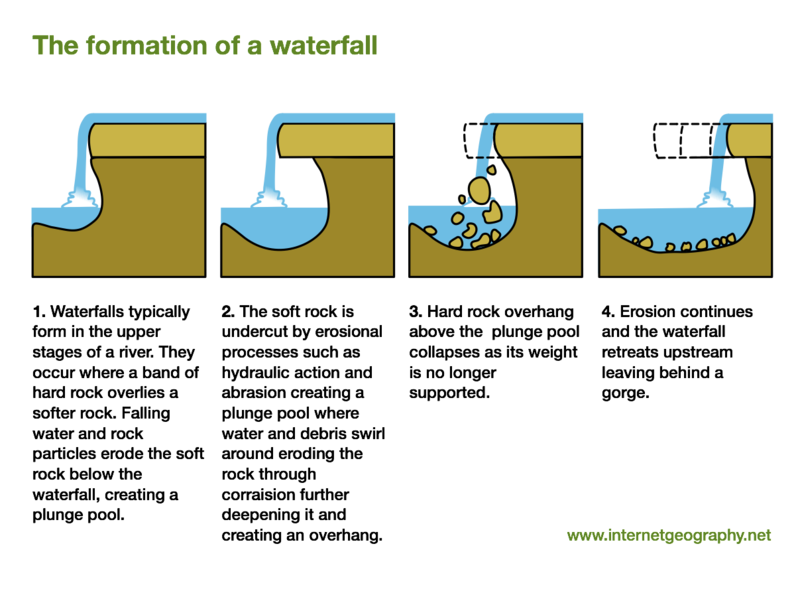 The diagram above shows the formation of a waterfall. Soft rock is undercut (1). This leaves a layer of hard rock which overhangs the layer of soft rock (2). The water flows over the overhang and creates a plunge pool in the soft rock below. 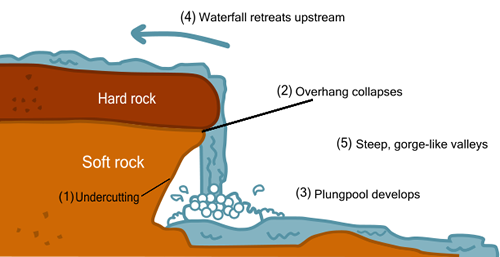 As the water hits the plunge pool it will erode it by both hydraulic action (the force of the water against the bedrock) and by abrasion (where the material carried by the river acts like sandpaper against the riverbed) (3). Eventually, the overhang will collapse due to the erosion of the soft rock beneath it. The waterfall then retreats upstream (4). This creates a steep, gorge-like valley. The formation of a waterfall. An example of a waterfall is High Force on the River Tees. At 22 metres it is the tallest waterfall in England. The River Tees tumbles over the Whin Sill, a layer of a hard rock called dolerite, which is known locally as whinstone. This resistant rock lies on top of softer sandstone, shale and limestone. The retreating waterfall has created a gorge 500m long. The model below shows Low Force, another series of waterfalls along the River Tees.